Well, that was my working title for an article published in the November issue of Business West. The title for the published article ended up as the more prosaic – but probably more appropriate – Let’s talk social media. A PDF version of the article is now available for download from this site. This is planned to be the first in a three-part series at Business West. I have just submitted article number two, titled (for now) To tweet or not to tweet. You’ll see it first on Business West. So today I presented this topic at trampoline. Trampoline is a “self-organising event for those who find the world interesting, have something to offer and share, and have an inquisitive mind”. I’ve been at some of the earlier trampoline days, and it’s great to get back and get energised again! This morning, I presented on the same topic as my last KMLF presentation – see this post for the details. This time, I have tweaked the presentation a little, and had the luxury of enough time to get the audience engaged in the conversation. Since the KMLF presentation, I have also written an article on this topic for Online Currents, which is being published this month. A copy of the article will be posted here a little while after the magazine is out. Have we all been introduced? Is everyone open and willing to change? Are we all taking equal turns? Is the talk friendly and constructive? Do we have sufficiently diverse viewpoints? 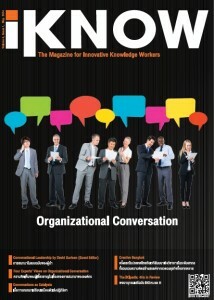 Some recent research has highlighted the transformative power of conversation. I presented on this topic at the Melbourne KMLF last night. This was one of three “Ignite” format presentations done on the night. This format requires twenty slides, timed at 15 seconds each. Total time per presentation – 5 minutes, plus discussion. The slide pack, including speaker notes, is available at SlideShare. A list of references is also included on the Notes page of the last slide. Some thoughts from Theodore Zeldin on “conversation and minds”, from David Gurteen’s site. Research by Anita Williams Woolley, et al, who found that “small groups demonstrate distinctive ‘collective intelligence’ when facing difficult tasks”. My previous post on The Idea Monopoly?. An article about Steven Johnson’s ideas on cultural progress, discussing his book Where Good Ideas Come From. Research by Oscar Ybarra, et al, showing that even brief, friendly conversations can improve individual mental function. We also discussed the pros and cons of the format, with mixed results. I think that it is a great format, provided that it can lead into further discussion as required. 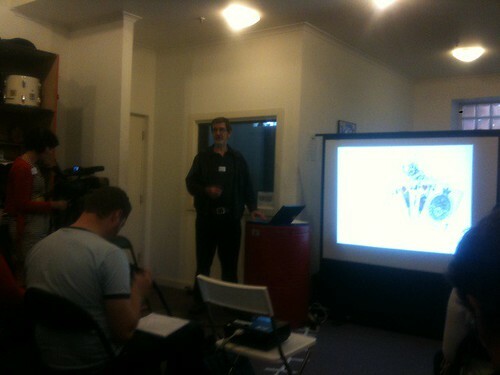 We have just started using MeetUp for managing Melbourne KMLF events, so expect further discussion on the MeetUp post.